Ecologic product - probiotic bark mulch. News! Ecologic product probiotic bark mulch. Used for indoor plants, terrace, patio, balcony flower boxes, hanging baskets, pots, rockeries. This product is eco certified [link] and suitable for biological agriculture in compliance with EU regulation 834/2007. 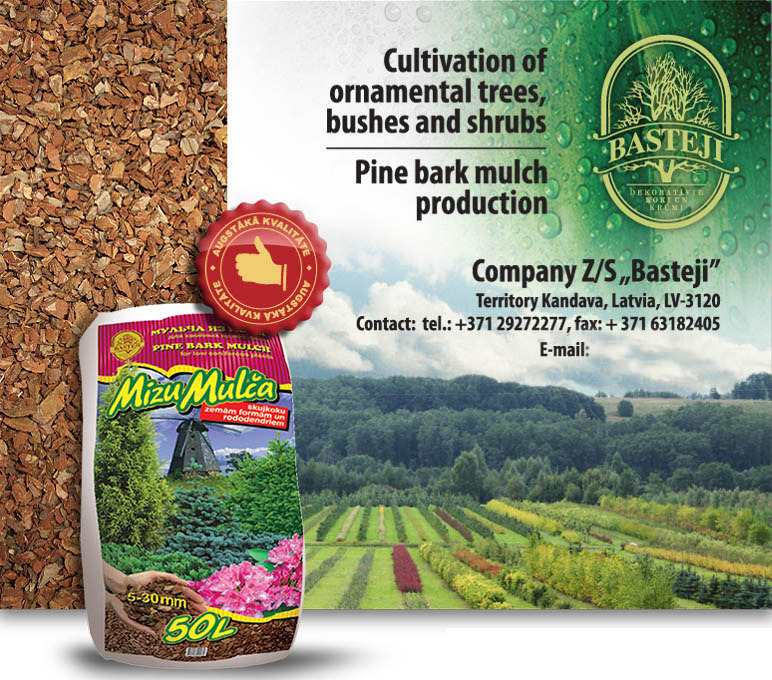 "Basteon" ® - finest quality, chemically uncultivated bark mulch. Composition is enriched with a selection of high quality bacteria to provide plants with good growing conditions: Paenibacillus polymyxa, Bacillus subtilis, Bacillus laterosporus, Bacillus licheniformus, Bacillus megaterium, Bacilluspumilus. Probiotics or the benign bacterias are useful microorganisms of the soil. Their main goal is to protect plants from the influece of negative outer factors, to strenghten and maintain plants immunity, as well as to fight against pathogenic mircoorganisms. Bark mulch is usable in balcony boxes, containers, terrace plants and pot’s cultures, and open field cultures. To cover the surface of a container with a 2-3 cm thick layer like any other mulching material. It is highly advisable to add it to the substrate in proportion 1:4, if preparing soil for plant replantation. To obtain better results, it is advised to use liquid or granular, organic or organomineral fertilisers that contain necessary nutritions for microorganisms. This product is eco certified and suitable for biological agriculture in compliance with EU regulation 834/2007.